In Kiyosumi-Shirakawa, a neighborhood where new shops have been opening one after another, a curious ramen shop has come ashore! 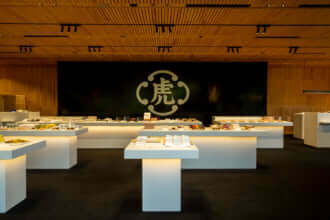 Following openings in Brooklyn and Kyoto, Yuji Ramen Tokyo has finally opened. The proprietor, formerly involved in wholesaling fish, considered ways of utilizing the humble parts of tuna that are usually discarded, eventually arriving at ‘tuna bone broth ramen’ which compares favorably with the more conventional ramen in pork bone broth. 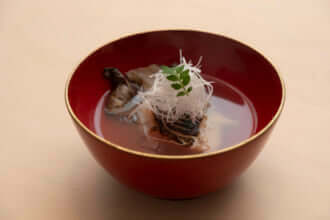 The broth obtained by boiling bones left over from filleting tuna has a dense, sour taste with all the flavors of seafood, yet lacks the typical fishy smell. The harmoniously balanced broth complements the straight, slender noodles. The tuna confit used as topping is juicy and goes well with pepper, adding zest to an already savory meal. 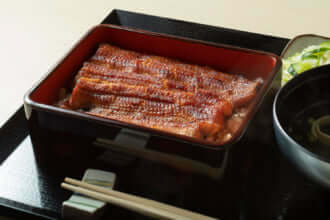 Here, on weekday evenings, sake and a tsumami menu (finger food and appetizers) are offered, arranged with unique selections such as yurinyu, prepared from minced tuna à la youlinji, the Chinese sweet and sour chicken dish. The stylish décor of subdued lighting and white bricks, which might easily be mistaken for a café, derives from the store in Brooklyn. The atmosphere, redolent of a ramen restaurant in New York, is casual, and across-the-counter conversation flows easily between staff and diners. Highly recommended for those who, after finishing off a bowl of ramen, want to linger and talk, sip sake, and relax.